Marjoram is from the genus Origanum, meaning ‘joy of the mountains’, which is apt since in France, Italy and Greece, hillsides are covered in these fragrant plants. Preheat oven to 120ºC. Butter a shallow gratin dish and put it into oven. Drop asparagus into a large pot of lightly salted boiling water for 4–5 minutes, then drain well, reserving water. Cut asparagus into 4 cm lengths and transfer to buttered dish to keep warm. Bring cream to a boil in a wide saucepan with shallots and most of the marjoram (reserve 2 teaspoons for garnish). Simmer until cream starts to reduce, then remove saucepan from heat and keep warm. Bring asparagus water back to a boil, then drop in some gnocchi, allowing room to swell. As gnocchi rise to surface (this takes a few minutes), lift them out with a perforated skimmer and drain for a moment over pot, then drop into marjoram cream. Repeat with remaining gnocchi. 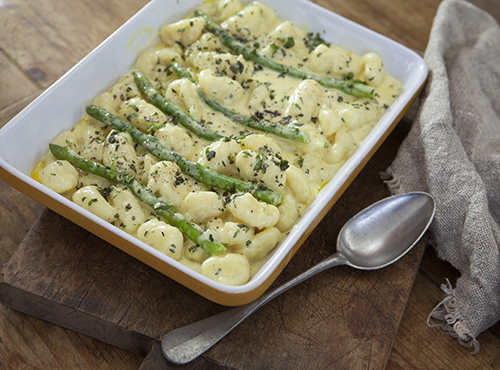 When all are cooked, season with salt and pepper and mix cream and gnocchi with asparagus. Scatter with parsley and reserved marjoram and serve at once.